… A day of celebrations with past and current team members and guests joining together at the Ponsonby Cruising Club, Westhaven Auckland on Saturday 1st September 2018. Over 100 people attended the 20th anniversary celebrations on a day filled with speeches, memorabilia, old photos & videos, a past uniforms fashion show featuring lycra shorts together with lots of time to catch up and share the entertaining “Remember when?” stories. There was laughter and tears at times. A wonderful personal message from Dr Don McKenzie who founded the worldwide movement was shared all culminating in a Flower Tribute on the water’s edge bringing the whole group together for a time of reflection. Dinner and live music and of course more stories completed the scene. One wonders when the ladies started down this road whether they would have dreamt the team would still be going strong 20 years later, still being enjoyed as much by the current team as the Originals did and all who have followed over the years. The bond in the team has always been strong and continues to this day; once a Buster always a Buster. 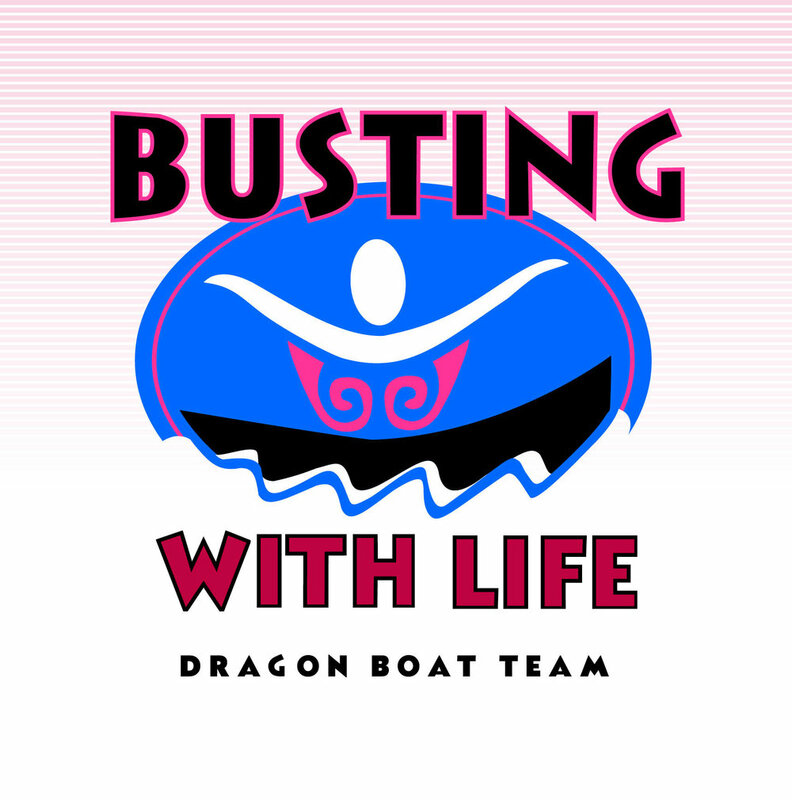 Busting with Life is the first Breast Cancer Survivors dragon boat team in New Zealand formed in 1998. A visiting Canadian BC Team, Abreast in a Boat, had been shown on TV paddling in the World Dragon Boat Champs in Wellington, earlier that year. 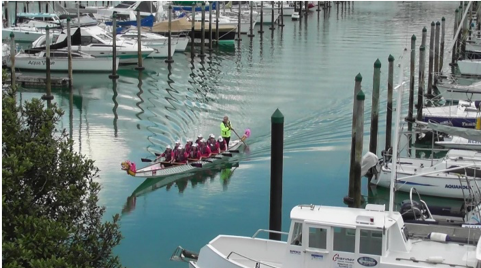 Around the same time the Breast Cancer Support Services (BCSS), also having seen Abreast in a Boat on TV, were contacted by a member of the team to see if there was a Breast Cancer dragon boat team in NZ. Trici approached BCSS and together with Lois, Frances, Pam, Paula, Debbie & Evelyn the dye was cast and Busting with Life (BWL) began. As well as being the first Breast Cancer Dragon boat team in New Zealand they were the first team outside of North America, some feat. The first meeting was at the Domain in Auckland and group fitness training continued on Sundays until training in a dragon boat at Lake Pupuke began. Wayne Gunn (Valerie Gunn’s son) led the fitness training and Graeme Rountree (Trici’s son) was co-opted as the coach. It’s not just about paddling. The team works to build public awareness of breast cancer, the importance of early detection and increasing breast cancer survivor awareness by providing appropriate exercise and fitness training, as well as giving support & camaraderie to paddlers. There have been many challenges and successes for BWL since those first years in learning how to become a cohesive and competitive, all-inclusive team. Dragon boating has become the official breast cancer sport, worldwide, and our team members have become international athletes at regattas in many countries. The sisterhood is strong, providing the excitement of racing, challenging competition and improved physical fitness. BWL has become part of a positive breast cancer movement of women willing to overcome physical adversity and prove there is life after breast cancer. At the 20th celebration it was moving to see the ladies reunite with their paddling partners and the current team loved hosting them and enjoyed hearing their many memories and stories. It was truly a wonderful celebration of our very special team.